I think most photographers, no matter what they photograph, can appreciate the vintage ‘40s Hollywood glamour portrait, made famous by legendary photographers – like George Hurrell. I think re-creating portraits like this can also be an important educational experience for upstart and even seasoned pro photographers because the crisp, direct lighting style used requires precision placement to shape the face beautifully. You quickly learn what works, and doesn’t work, when lighting the physiognomy. I recently did a couple of workshops on SPTV.me and creativeLIVE.com where I demonstrated a plethora of lighting styles and techniques. The Hollywood glamour style is always one of my favorites as it’s beautifully transformative and a great exercise in posing, lighting, and styling. I’ve put together a breakdown of the basic ingredients so you can play with it yourself too. A subject willing to turn on the “sassy”! The traditional Hollywood portrait is all about the eyes. Well, to be fair, other stuff will be important too, but the eyes are where your emphasis really should be. You want to pose your subject so that the face is generally closer to the camera and the eyes have primary focus. Even if you are doing a full length pose, highlighting a beautiful dress and the body that fills it, the eyes must draw you in and keep you mesmerized. In many of the original images from the era, you don’t see very shallow depth of field. However, I really like to use this as a modern twist on the style. I often photograph at f1.4, f1.8, or maybe f2.0 to keep everything but the eyes somewhat soft and mysterious. I also enjoy using my Lensbaby to really tweak the area of focus for even more interesting variations. Try it a few different ways to see what you prefer. Posing will be dramatic, often un-natural feeling, and usually uncomfortable for the subject to hold. If it hurts, you’re probably doing it right! We always joke with our subjects that the poses that feel the weirdest often turn out the best. Of course, this rule doesn’t apply to all portraiture, but with Hollywood glam, it’s no pain, no gain! Even if the pose doesn’t necessarily cause physical pain, it won’t be a position your subject would naturally just fall in to while waiting for the bus. You need to work it and ask them to work it with you. Now comes the fun part, lighting! The beauty of this crisp, direct lighting style is that there is little room for error. 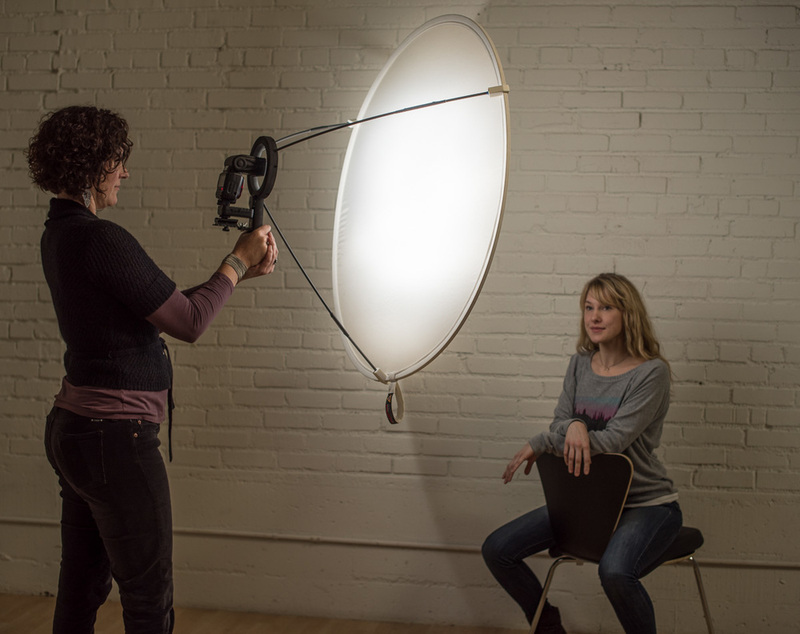 If you don’t position your main light just right, the face will not be flattered and the style will not be realized. Hurrell really favored the “butterfly lighting” style, which is exemplified by placing the main light source directly in front of the subject, above the eye line, aiming at their nose. When lit correctly, you’ll see a “butterfly” shaped shadow just directly under the nose that does not cross the lip line. The light should also be placed so that you can just see the catchlight in the top portion of the eyes. Sometimes, you may not see the catchlight and instead will see dramatic shadows cast by the long, lush eyelashes. I find it really helpful to have an assistant holding the main light so that I can play with placement easily and see the affect it has on the face and the mood of the portrait. Of course, your assistant needs to be keenly aware of where they hold it so it is repeatable and consistent, but that is great training for them as well. By placing the light slightly to the side, instead of directly in front of the face, you create more Rembrandt style lighting – with a triangular patch of light on one cheek and shapely shadows on the side of one jaw. This is also fun to play with and adds more depth and dimension to the face. Take several images and play with your light positioning, examining the results after each move. You’ll quickly see patterns that you like, that flatter your particular subject more, or emote the Hollywood style better. The classic hollywood images were usually done with “hot” lights, with little or no diffusion. They created hard, defining shadows that required expert placement of the lights and serious retouching artwork to make the final image look appealing. I personally prefer to use a diffused, small light source that still gives me the dramatic shadows, but with a softer, more forgiving light quality. I’ve used a beauty dish, small softbox (about 8”-10”), and more recently, my new product with Wescott, the LunaGrip with the flash head set for maximum zoom to shrink the light signature, creating beautiful soft shapely shadows. A second light can be added for a hair light or accent light. I usually use a speedlight with a Rogue Grid attached to it which helps to beautifully focus my beam of light just where I need it, without adding unwanted spill light in the image. Beam some of this on your subjects hair to add sheen and glamour. Once you’ve captured the image you want, the post-processing is equally important. Classic Hollywood portraits were hand-retouched extensively, softening every little imperfection the harsh, direct lighting revealed. They were also given a little dreamy, romantic glow (often done in camera with nylon stockings held over the lens or over the enlarger lens when printing). I like taking the digital route and using one of my vintage Lightroom presets or Photoshop actions. For the portrait at top, I used my “BW Ethereal” preset from the Vintage Delish Lightroom preset package and “Porta Soft” from the Workflow Collection presets. Adding vintage glamour portraits to your repertoire is not only a great option for your clients, but a wonderful way to learn about the subtleties of light and posing while having a lot of sassy fun in the process!